Happy Sunday everyone! I have changed my Artful INKables posting day to Sunday. My previous posting day of Thursday just wasn't happening for me lately. I have more time on the weekends to do my cards. So Sunday it is! I decided to use the current Color Throwdown colors. Great combo and it really helped get the creative juices flowing for me today! 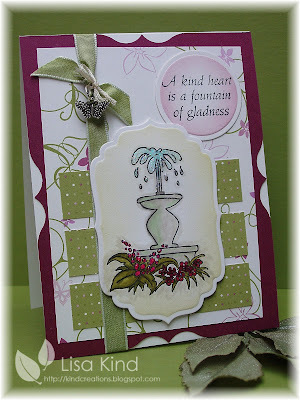 Our Artful INKables DT memeber, Jen Pahoulis, did this tile tutorial on the AI blog recently, and I decided to use it. I had done this once before and really liked the outcome. It's nice to come back to a technique you haven't done in a while. Here's what I came up with. I used an AI set called Fairy Whimsey. There is a fairy in the set, but I chose to use the flower and the butterflies. I have to confess that I accidentally grabbed Bravo Burgundy paper and matched my copics to it to color the flower and butterflies. I realized my error and had to restamp and color the flower. I just colored over the butterflies because the parts were so small. I tried that with the flower, but just got a dark, muddy color! It just never goes smoothly! To get the tiles, I just loosely measured the flower and butterfly stamps and then cut my 5" x 3 3/4" piece of white card stock accordingly to fit those two stamps. Then I cut the remaining pieces randomly. Each piece was sponged with Baja Breeze to get the "grout" look. I secured them to the eggplant piece and then onto my celery base. I used the Martha Stewart butterfly trio punch to get the butterflies...one in each color. There are green crystals adhered to the middle of each one. I bent them to get some dimension. I also added stardust stickles to the butterflies and the flower for some sparkle. I hope you enjoyed today's post. I really appreciate your comments! 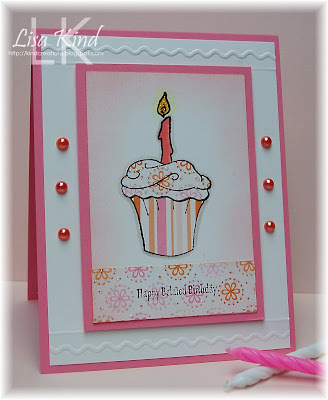 Please join me on Tuesday when I'll be participating in the Paper Makeup Stamps Birthday Bash blog hop. PMS turns 2 on February 2, and there will be some partying going on. See the announcement on the top left side of my blog. Click on it and it will take you to the PMS forum, which is where the party will be happening Tuesday night! See you then! 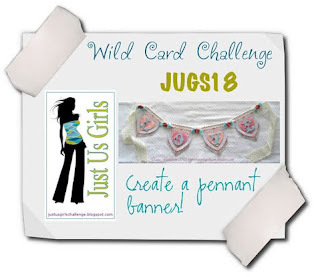 Wild Card Challenge with Just Us Girls! This week's challenge with Just Us Girls is a wild card challenge being hosted by our lovely and talented Dana. It's a wild card because it's the 5th week in the month, something that only happens once in a while. 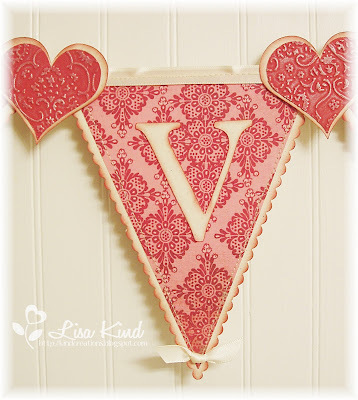 Dana has chosen a fun challenge for us today...make a pennant banner. There is a tutorial on SCS for these banners and that's just what I used to guide me through this. There is a bonus challenge to create your banner around a "Love" theme, so that here's what I came up with. This was super easy to do. The difficult part for me was I challenged myself to sew it all together! Issues with the thread coming out of the needle, bobbin problems, loose threads everywhere, blah, blah, blah! LOL!!! But I mananged to keep going! Here is a close up shot of one of the pennants. I used an older dp (there's my New Year's resolution again!) from Basic Grey called Blush and backed it with Naturals Ivory from SU. I trimmed the edges of the ivory paper with my decorative scissors, then sponged it with Riding Hood Red and Sahara Sand ink. The letters and hearts were cut with my new friend, the Cricut Expression! Cutting twelve hearts in two different sizes and the five letters was SO EASY and FAST! I ran the red hearts through the textile folder and then highlighted the raised edges with a metallic rub on in golden white. It really shimmers nicely. The edges of the ivory hearts were sponged in the red and sand colors as well. I sewed the pennants and the ivory satin ribbon together. I also sewed around the perimeter of each pennant, and then added the little satin bows on the point of each one. Now you have to stop by the JUGs blog to see what the other girls have done, and then stop by their personal blogs to read more about their banners. Thanks for stopping in today. I hope you can play this week with Just Us Girls! I'm sooo glad it's Saturday. It seems to have been a very busy week! 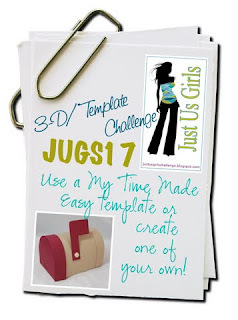 But the Just Us Girls team has a great template challenge for you today and we are teasing you a bit, as well. We are being sponsored today by Lauren Meader from My Time Made Easy, and we are showing sneak peeks of her new line of Pretty Impression stamps, Pretty Packaging, and Pretty Printables. These won't officially be released until February 1st. Here's my JUGs project. The stamp set is called Critters with Heart and has several different critters made with hearts. I just fell in love with this raccoon, so I had to use it for my project. There are several sentiments that go with each of the critters. 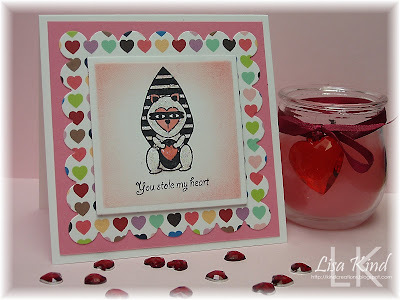 I just love this "you stole my heart" sentiment with this raccoon. He looks like a jail bird in his stripes! 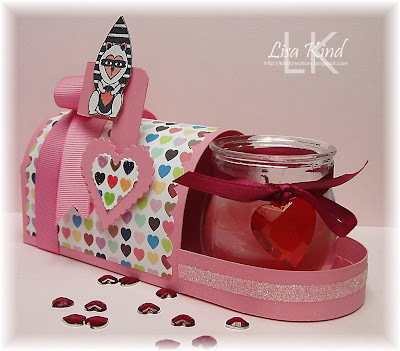 The template is appropriately called Happy Mail and is so easy to pull together. I used the SVG file of this template with my Cricut Expression (for the first time...yeah!!) and after a little fiddling and a phone call to my friend, Kristin, I was up and running! (I realized I didn't read all of the instructions Lauren includes with her files, which would have answered my question. I was too excited to get cutting with my Cricut!) Having the Cricut cut it for me was a dream! 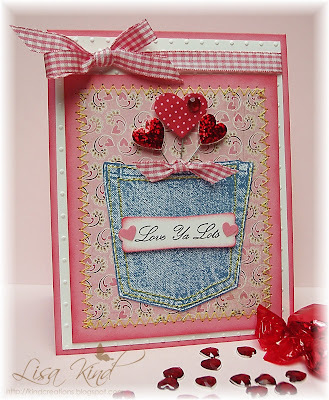 The digi paper is called Love Notes, designed by Kristin, and includes four different designs. This one is called Multi Hearts and I fell in love with this as well when I immediately saw it! 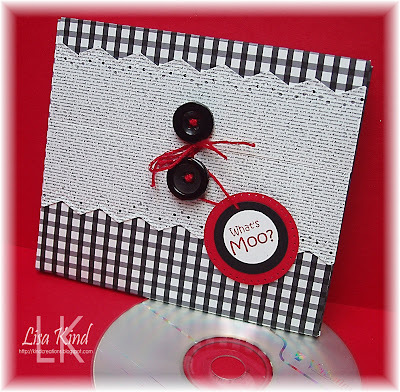 There is a gingham print pack and a polka dots print pack being released also. Real pretty colors, too! Want to see more? Stop by the JUGs blog and see what the JUGs DT has done. You might also want to stop by their blogs for more pictures of their individual projects and leave some love. Here are the links to their blogs and our guest designer for January Gabby Arriaza. I'm also including Lauren's blog because I think she has something fabulous to share as well. We hope you can play our challenge. You don't have to use a MTME template to play, but there is a free one you can download called Cutesy Cover. You might want to give that one a try, or use any template of your choice! We'd just love to see you play along! ***I forgot to mention a really important piece of information....There is some awesome blog candy being offered for this challenge! Lauren is offerring a $25 shopping spree to her store! So this is another reason to make sure you enter! *** Thanks for stopping by and have a great weekend! Today is Thursday (for two more hours! ), and it's my day for an Artful INKables post! With Monday being a holiday for me, I got my days mixed up and thought today was Wednesday! So I'm almost late, but not quite! This week's Think Ink Tuesday challenge is to THINK SPRING!! To me that means light and pretty colors. I haven't used this set called Birthday Best from AI yet (gasp! ), so I pulled it out and paper pieced this large cupcake. I used SU's Sweet Always dp which has pinks and oranges in it. I have a sweet friend that I am delinquent in sending a birthday card to, so I used the belated birthday sentiment on the front. I kept the layout really simple. The pearls are from AC Moore...there are 60 pearls on the sheet for $1! What a find! I bought them in every color! 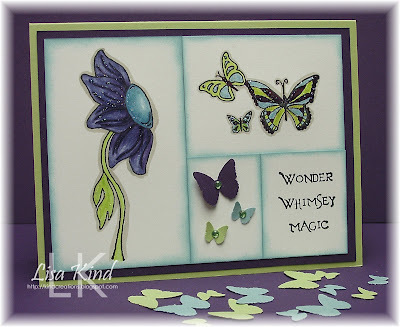 If you want to play this challenge, head over to the Artful INKables blog and enter your card. You may win a grab bag of AI stamps! Thanks for stopping in today! I'll be back on Saturday with a sneak of something really cool! See you then! One of our illustrators, Diem Pascarella drew this wonderful image. All proceeds from the sale will go directly to the Tadlock family. They have set up a scholarship fund in Baylee's name with http://projectride.org. Project Ride is a program giving therapeutic recreational horseback riding instruction to children and adults with special needs. PMS is designating the funds for the Tadlocks to use as they need." So please go to the PMS website to purchase this image. 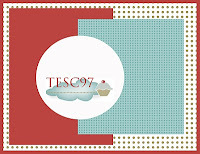 You can go the PMS blog to see the wonderful cards created by some of the DT with this image. Thanks so much for stopping by today. Hi everyone! I'm here with another challenge from Just Us Girls, and let me tell you we were blown away by all the participants from our sewing technique challenge last week! It was amazing! All the girls were so happy to see so many of you participating! It's the second week of the month, so that means a color challenge. Kristin is our hostess this week and she chose some amazing colors. Here they are. We all had lots of fun with these colors and we hope you will too. It's perfect for this time of the year with Valentine's Day right around the corner or for a birthday card, which is what I made. I used SU's stamp from Thoughts and Prayers. It's been a long time since I've used my SU stamps! I've always loved this stamp, and I've seen it colored in so many different colors, beautiful each time. It's colored with blush, gray, and burgundy SU markers, stamped on a piece of very vanilla, and then I cut and embossed it with a nestie. While still in the nestie, I swirled some basic gray ink around the perimeter of the image. I love that technique...you don't have to use a mat. 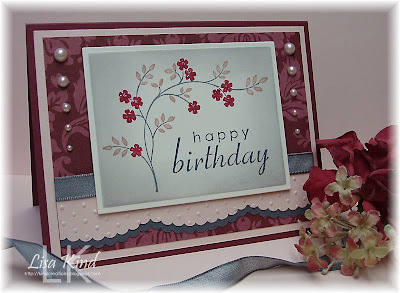 The sentiment is from a set just released on Thursday from Paper Makeup Stamps, called Birthday Cheer. You can see what the other JUGs DT have done by going to the JUGs blog. That's where you can link your direct post if you are planning on playing. You can also leave some nice comments for the JUGs girls on their peronal blogs. Thanks for stopping in today. Happy Stamping! A Charming Hop with Artful INKables! We hope you are enjoying our Artful INKables Charming Hop! If you've come from Deb's blog, you are on the right track. If not, start at the Artful INKables blog to get the details and follow this "Charming Hop"! The premise of this hop is to showcase the variety of beautiful charms Artful INKables has and to reacquaint you with some of the wonderful stamps in the AI inventory. I have chosen Greek Gardens to share with you today. I can honestly say that I really like this set. I puchased it a while back and just love the images and sentiments in it. I especially like this sentiment. I wish the photo would show how much green I put on the vase. It is so washed out on it here in the picture. I also put star dust stickles on the water. 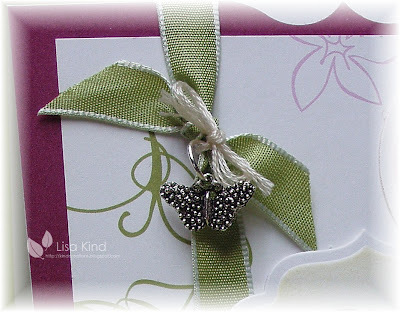 I paired this image with a beautiful butterfly charm. Here is a closeup of the charm. I love the detail on this pretty charm! I just put a jump ring on it and attached it to the ribbon with embroidery floss. 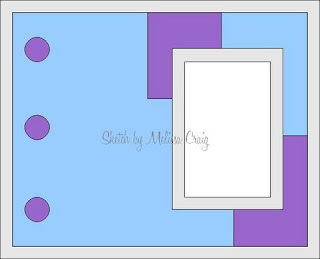 The sketch is from this week's Card Positioning System sketch (CPS). So, to continue on this Charming Hop, please head on over to Michelle's blog. She always has something amazing to share! There will be a prize giveaway at the end of the hop, but you need to leave a comment on the blogs along the way in order to be entered into the random.org drawing. So, don't forget to leave some nice comments for the AI DT. Thanks for stopping in today! I hope you enjoyed your Charming Hop! Hi everyone! Today is the day! 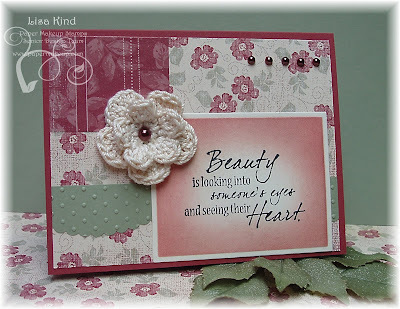 The January release of new images and word art from Paper Makeup Stamps! If you have come here from Dawn's blog, you are on the right track. If not, please start at the PMS blog because I am the last stop on the hop and you won't want to miss all the fun that's happened before this stop! I have a beautiful quote to share with you today from William Shakespeare. Who could write a prettier, romantic quote than ol' William? I'm lovin' this card! The colors are just so pretty and feminine! I used Basic Grey's Two Scoops dp and barely banana. When was the last time you used that color? I also tried my hand at sewing again! I still had the yellow thread in the sewing machine, so I went with it! I still need a little practice, but I do like the technique. I used markers to color the stamp (another thing I haven't done in a long while! ), and then while the paper was still in the die, I sponged some barely banana ink on it as well as around the white mat piece. I added the ribbon, button, and pearls and I was done! I started with this week's Taylored Expressions sketch. Now if you've been following along, you should have been picking up some letters that will spell out a code you can use tonight at the store to get a discount on the entire January release. I have the last letter for you which is the letter "R". We hope to see you at the release party tonight in the PMS forum. It begins at 8:00 pm CST. There will be prizes, chatter, and the announcement of the winner of the ENTIRE RELEASE! Go to the PMS blog to find out the details. Thanks for stopping in today! See you later tonight! Today is the final day of sneak peeks for the January release of Paper Makeup Stamps. We have some fabulous word art to show you today. PMS has such a vast amount of word art in their store, and there are quite a few that are in digi form if that is your preference. Here is the one I have to share with you today. Isn't this a lovely quote? I think it would be perfect for Valentine's Day, anniversaries, new baby, etc. Very versatile, indeed! I used yesterday's SCS sketch for this card and acted upon my New Year's resolution to use up some of my dp. This is a very old SU dp called Recollections...it's not even double-sided and the paper is very thin! They've come a long way! I paired it with cranberry crisp and mellow moss. I swirled cranberry crisp ink around the edge of the sentiment while it was still in the nestie die. I also used some sahara sand to tone it down a bit. I saw this trick used by my friend, Cheryl Rowley. Speaking of which, I was gifted this crocheted flower from Cheryl. I believe she crocheted it herself! Talented girl! I have three others to use as well! Thanks Cheryl! I think it made the card look more vintage. I added a Kaiser pearl to the center of the flower and smaller ones in the corner. To see more of the Word Art being released tomorrow, please stop by the PMS blog. The PMS DT have once again created some lovely projects for you. Remember to comment here and on the PMS blog to have the chance to win the entire release and/or some free stamps! Stop by again tomorrow for our blog hop all day and our release party at 8:00 CST in the PMS forum. Thanks for your kind comments the last two days...I really look forward to reading them! See you at the hop tomorrow! 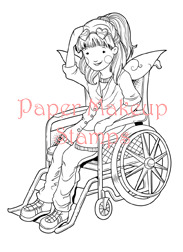 Today we have Day 2 of the sneak peeks for Paper Makeup Stamps January release. Did you like what you saw yesterday? 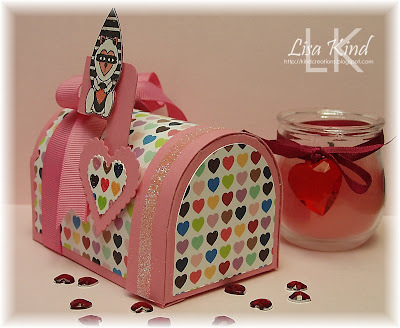 If you haven't seen our "Love Day", then stop by the PMS blog to take a peek at them. 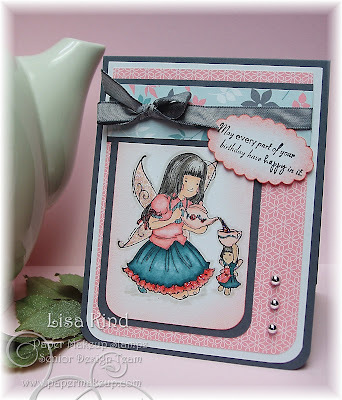 Today's theme is "Birthday" because there is a great new birthday sentiment set being released called "Birthday Cheer" and I also have a new fairy to preview today. Her name is Ally and here she is. Is this a cute fairy, or what? I just LOVE these fairies! And I love tea! The sentiment (isn't it great, too?) is from "Birthday Cheer". It is one of seven sentiments in the set. If you go to the PMS blog, you'll see all of them being used along with more new fairies and monsters. Thanks for stopping in again and please make sure you leave a comment here and on the PMS blog. There are chances to win some stamps and maybe the entire release! Stop by the PMS blog for the details! See you tomorrow for another peek! Today is the day we start sneaking the January release of Paper Makeup Stamps! We are doing it a little later because of the holidays and a few other reasons, but we are here! The release will be Thursday, January 14 with a blog hop all day and a release party in the evening at 8:00CST in the PMS forum. Today is what we are calling our "Love Day" where we are sneaking all images relating to love or Valentine's Day. I have a lovely Moody Girl to share called Moody for Love. I paired this Moody Girl with another new set being released this month called "Hugs & Kisses". 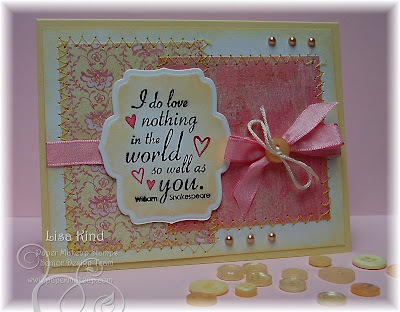 There are three different hearts in this set and eight different sentiments. I had this one piece of SU's Bella Rose dp to use as my starting point and last Monday's Mojo Monday Sketch. If you feel intimidated by these Moody Girls, don't be...seriously. They are such fun to color and the end result is always a "wow". Want to see more Moody Girls and some new fairies and monsters? Then head on over to the PMS blog to see what our new PMS Makeup Artists Design Team have done. They really pulled out the stops for this "Love Day"! Please stop by tomorrow when we have more fabulous sneaks for you! Thanks for stopping in today, and have a great Monday! Just Us Girls Challenge - Sew Easy! Hello again! It's Saturday! Time for another Just Us Girls challenge! Today, Mona has a challenge that is "sew" easy! That's right...the challenge is to sew on your card. Now Mona is the queen of this technique, if you've ever seen any of her beautiful cards! You can use any kind of sewing for this challenge too. Machine sewing, hand sewing, and even faux stitching! If you don't know what faux stitching is, you can get instructions on SCS with this tutorial. It's very easy and I really like that technique. (You can also see how I used it on this card.) However, I recenly purchased a cheap Pixie Craft Sewing Machine by Singer at Walmart before Christmas. It was on sale for about $35, so I thought I'd give it a try. Let me tell you it works like a charm! Look what I did with it. I've had this jeans pocket stamp (yes that's a stamp, not real jeans!) from my LSS one day while I was standing in line. It just called to me to pick it up...and I did and this is the first time I'm using it! The stamp is from Judi Kins and I inked it with Faded Jeans Distress Ink from Ranger/Tim Holtz. It really is the color of faded jeans...amazing! When I took my sewing machine out of the box, it was already threaded with yellow thread. Perfect, since jeans usually have yellow stitching. So I went to work following the stitch lines on the pocket. Here's a closeup of it. I really like the way it came out...it looks so real! The dp is Basic Grey's Bittersweet, and I paired it with Regal Rose. I sewed the dp to the cardstock with one of the three zig-zag stitches on the machine. I ran the white mat through the Swiss Dots cuttlebug folder. 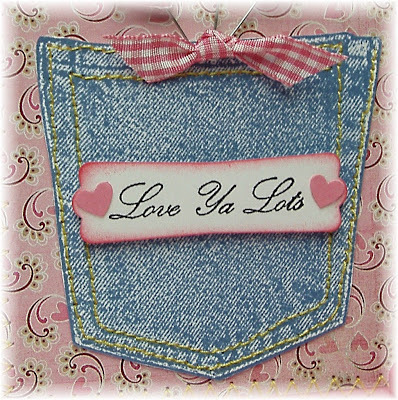 The sentiment is from Artful INKables newest set called Love Ya Lots. Love that sentiment! Those hearts coming out of the pocket is something I picked up at Target's dollar spot probably 3 years ago! They were connected together, but when I took them out of the box, they all came apart. So I had to manipulate them into the pocket and I added a tiny piece of ribbon to match the bow on top. 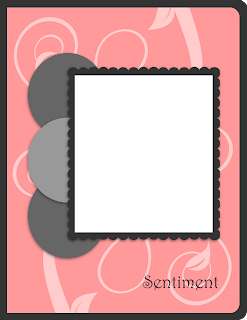 Those little hearts on the sentiment tag are from the Martha Stewart heart border punch. It's the little confetti that is left after punching. I'm pretty happy with the way this came out. It was just what I imagined when I was thinking all day about what I was going to do, which rarely happens, right? 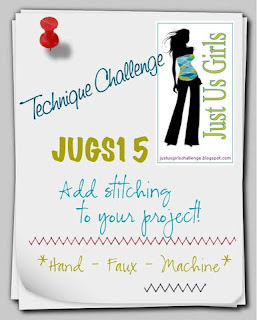 The JUGs team would like to see what you do with your sewing project. We know lots of you like this technique because we see it a lot out there. But if you are new to this technique, try it...you'll love it! The faux stitching is great too. So please stop by the JUGs blog and see what the other DT members have done with this technique. You can also go to their personal blogs to read about how they created their cards to get more inspiration. The Friday Paper Makeup Stamps Makeup 4 the Weekend Challenge this week is a sketch challenge. This sketch was created by none other than me! Two sketch challenges in a row for me (last week's JUGs sketch challenge was mine too!)! I LOVE them, but always follow them, not create them! Here is the sketch for this week's challenge. So what do you think? 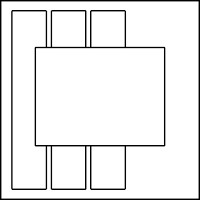 Can you work with this one? Here's what I came up with. Since Valentine's Day is right around the corner, I decided to do a Valentine's themed card. I love the PMS Beautiful Day Fairies (it's what drew me to the company), so I used the Heart Fairy. The color combination came from the Color Throwdown Challenge blog and were chosen by their new DT member and my fellow JUGs DT member and friend, Kristin Bueter. The colors are Regal Rose, Chocolate Chip, and Dusty Durango. Kristin has recently joined forces with Lauren Meader's new company, My Time Made Easy, and is creating digi paper. I used two prints from the Fluttering-by pack since they included these colors. I colored the Heart Fairy accordingly with copic makers. 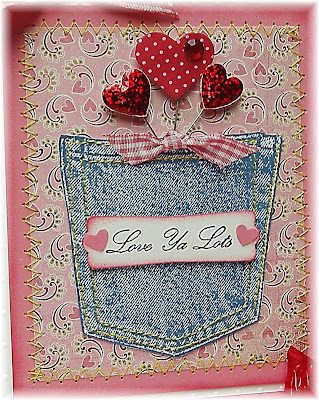 The hearts were cut with nesties and embossed with the Swiss Dots folder. The sentiment is also from PMS and went perfectly with my image. I placed some star dust stickles on the fairy, corner rounded the two outside corners and was good to go! Oh, and the candy? GONE after taking this picture! They were chocolate covered cherries.....the cheapo ones that are one of my favs! So why not head on over to the PMS blog and see the details of the challenge and another sample of the sketch from DT member Christi Thorsen? You won't be disappointed! Thanks for stopping by today and have a great weekend! It's Thursday, so it's time for my Artful INKables post! Today I'm using Down on the Farm on a template. I've had this idea running around in my head for a while, but I just couldn't figure out how to pull it off. It came to me yesterday (thank goodness, just in time!). Let me explain what I was thinking when I made this. When I thought of "What's Moo? ", I thought of keeping someone far away up-to-date. What better way to do that than with pictures? Well, it seems no one sends "real" pictures these days, they are always digital. So I made a CD cover with this My Timeless Template called Music Makeover to insert a CD in it that contains digital pictures. So I started with this new digital paper from My Time Made Easy called Flutters and Flowers. I printed this black and white gingham print directly on my white card stock, then put it right back in the printer and printed the template on the back. I then cut, scored, and assembled the template. I also used the script pattern from the same digital paper pack for the accent piece. I trimmed the edges with a Martha Stewart border punch. The buttons, floss to keep it closed and tag were added. Love the black, white and pop of red! There is a new challenge going on at the Artful INKables blog, too. It's a monochromatic challenge. I sort of got that going on here...except for that punch of red! I hope I'm forgiven! You can check out that challenge here to see all the details. You actually have until Monday, January 18 to complete the challenge to be in the running for a grab bag of stamps from AI! The Artful INKables design team is going to have an interesting blog hop on the 15th (next week Friday), so be sure to stay tuned for that! 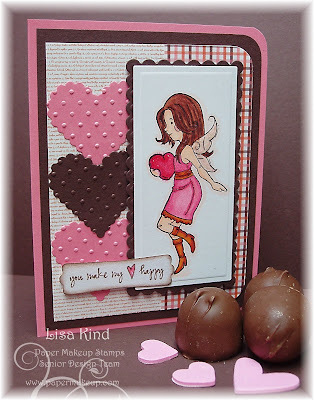 Paper Makeup Stamps is sponsoring another challenge blog...this time it is the Tuesday Morning Sketches challenge blog. I was pretty happy to find another sketch challenge blog because I love sketches! Here is the great sketch. I did my card last night after I found out PMS was hosting this challenge, so I did something quick and easy using the PMS stamps set Starstruck. I also used the current PMS Makeup 4 the Weekend color challenge of silver with either black or blue. I chose to use SU's Night of Navy with their brushed silver paper, which I ran through the cuttlebug with the swirls folder. 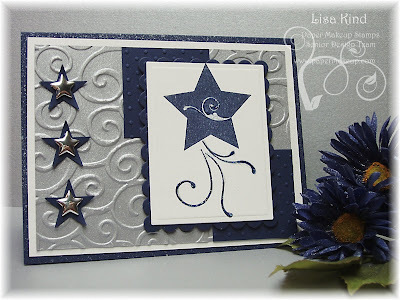 I stamped the star and flourish in Night of Navy ink and placed some star dust stickles on it. 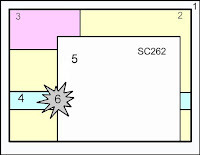 The navy squares were run through the cuttlebug with the swiss dots folder. The navy stars were punched with the small stars SU punch, and the silver stars where something I picked up at a discount store. I think this could be used for a variety of occasions...graduation, birthday, way to go, etc. I hope you can check out both challenges and play. 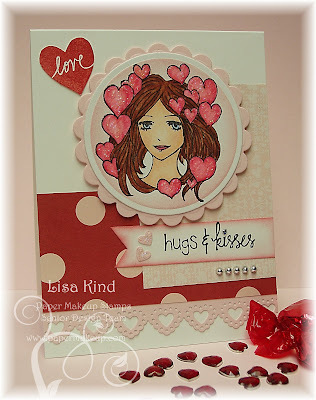 You can find them at the Tuesday Morning Sketches challenge blog and the Paper Makeup Stamps blog. Thanks for stopping in today!